People says that nothing is impossible in this world if someone goes till the threshold. There is such an impossible development done by Kritin Nithiyanandam of U.K who is just a 15-year-old Indian origin lad, who created a potential test for Alzheimer disease which could allow the disease to be diagnosed 10 years before the first symptoms appear and even stop its progression. Now he has arrived with another life saver creation recently. He devised a way to treat the most deadly form of cancer more treatable i.e Breast Cancer which is more common among women. He devised an effective way to reduce the imbalance of Progesterone and Astrogron via medicines which are the main cause of such cancers. He also won the google's science fair award last year for creating an Alzheimer’s test which can spot the disease 10 years before diagnoses. It has been estimated that almost 7,500 women each year are diagnosed with triple-negative breast cancer, a type of disease which does not respond to today's most effective drugs. Krtin Nithiyanandam currently residing in Epsom, Surrey ( United Kingdom ), has developed a 'trojan horse' antibody sometimes before that could penetrate through the brain and capable of attaching with neurotoxic proteins generally present in the first stages of the disease. The antibodies, which would be injected into the bloodstream are also attached to fluorescent particles which can then be picked up on a brain scan. He also submitted his projects and test to the Google Science Fair Prize and we all have to wait for next month for the results as he might get some rewards or scholarships for further experiments. He told media persons that "The main benefits of my test are that it could be used to diagnose Alzheimer's disease before symptoms start to show by focusing on pathophysiological changes, some of which can occur a decade before symptoms are prevalent,". Because of the blood-brain barrier, diseases like Dementia are very hard to diagnose. Kritin antibodies can even pass these barriers. Recent Lab tests even showed that they 'handcuff' the toxic proteins, stopping them from developing further which could potentially stop Alzheimer's in its tracks. 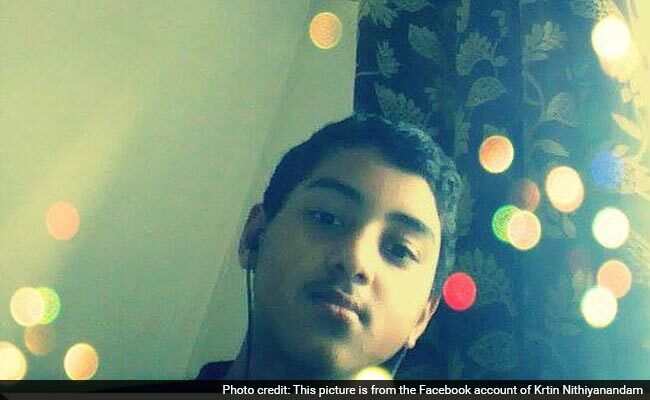 Kritin who attended Sutton Grammar school also told to media that "Some of my new preliminary research has suggested that my diagnostic probe could simultaneously have therapeutic potential as well as diagnostic,"
When Kritin was a child, his family moved to Britain from India. He then completed his school life from there and willing to study about medicines further. He was suffering from the hearing problem and that's why his baby heart was full of will to cure his own problem just by learning about medicines. He also wanted to dedicate his studied and quests about medicines for the benefits of disease laden persons. He uttered that "I have personally seen what a difference it can make to people's lives and I want to make a difference to the lives of others,"